In line with the Supreme Court directive, insurance companies will now offer only three-year insurance for cars and five-year insurance for two-wheelers under the third party segment from the next month. The Supreme Court has ordered all general insurers to offer long-term third party insurance on vehicles sold on or after September 1. In line with the court directive, insurance companies will now offer only three-year insurance for cars and five-year insurance for two-wheelers under the third party segment from the next month. Following the implementation of the Supreme Court order, prospective vehicle buyers will have to pay more than Rs 24,000 for new cars and over Rs 13,000 for new motorcycles in third-party insurance. The insurance regulator, Insurance Regulatory and Development Authority of India (IRDAI), has asked all general insurers in a circular to implement the changes in third party insurance cover as mandated by the Supreme Court. From September 1, insurance companies will offer either long term package cover offering both third party insurance and own damage insurance for three or five years, as the case may be, or a bundled cover with three-year or five-year term for the third party component and an one-year term for own damage, as per the IRDAI circular. Third party insurance covers liabilities if the insured's vehicle is responsible for an accident which results in injury to or death of a third party. In this case, the insurance company pays the third party on behalf of the insured. Own damage insurance cover is meant for the protection of the vehicle in case of accidents. In an order dated July 20, 2018, the Supreme Court had asked insurers to offer long term third party insurance cover. Earlier, insurance companies were offering one-year insurance cover under the third party segment along with multi-year policies, but consumers' interest in the latter remained lukewarm in absence of a regulation making them mandatory. As a result many vehicles plying the streets ended without insurance cover one year after their purchase. The new rates for third party insurance will be applicable for vehicles purchased between September 1, 2018 and March 31, 2019. Insurers are supposed to submit a Letter of Intent, signed by the CMD or CEO of the company, before August 30 for offering such packages or bundled covers. The IRDAI will allot an UIN to each insurer on receiving the aforementioned Letter of Intent. The premium has to be collected for the entire term (three years or five years as the case may be) at the time of sale of insurance but would be recognised on a yearly basis, the IRDAI circular said. It further mentions that third party insurance cannot be cancelled by the insurer or the insured. It can be cancelled only in the event of double insurance, if the vehicle is sold, or is not in use anymore. 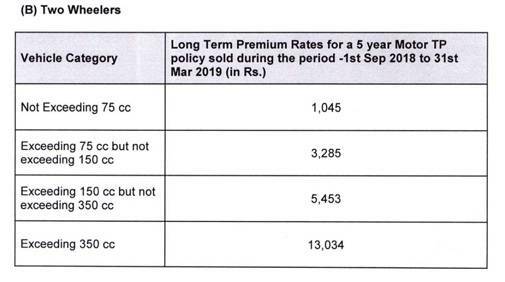 Prices for the long-term third party insurance have been categorised on the basis of type of vehicle and engine capacity.